"There is a vitality, a life force, an energy, a quickening that is translated through you into action, and because there is only one of you in all of time, this expression is unique. And if you block it, it will never exist through any other medium and be lost." The White-Eyes are regular visitors to my garden. They normally flit around furiously catching the tiniest insects hardly visible to the eye and never sit still for long. Did a quick out-line sketch of this chappie as he gave me the cocky eye and finished it off once they had moved on, taking reference for colour from one of my bird books. 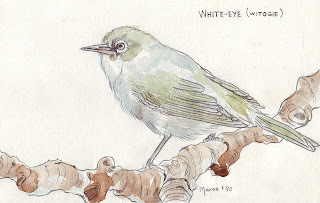 I did this sketch almost 20 years ago and I'm still as fascinated with the White Eyes as the first time they visited my garden.